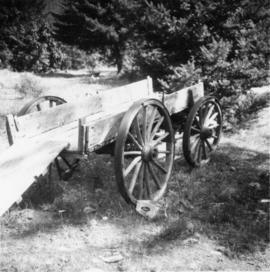 Photograph depicts a 4-wheeled cart located on the Indian Reservation that adjoined the head of Seton Lake. 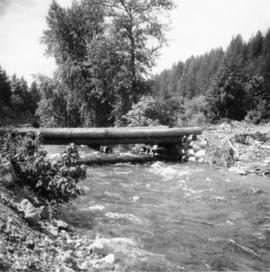 Photograph depicts a bridge near the beginning of the Seton Portage to D'Arcy dirt road over the Portage River. The road was a one and half of a mile connection between the Anderson (upper) and Seton (lower) lakes. 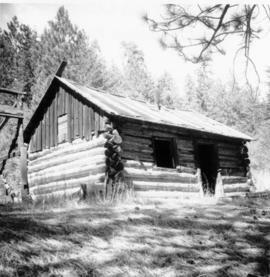 Photograph depicts a deserted cabin on the Indian Reserve above the PGE track at the northwest corner of Seton Lake. It probably had been occupied up until the last 5 years. 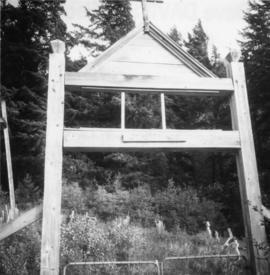 Photograph depicts an entrance gate to a First Nations graveyard that overlooked Anderson Lake. 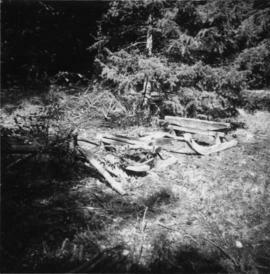 The gate was inscribed "Graveyard" and a side post was dated November 1952. 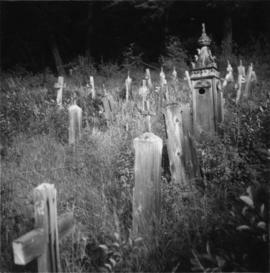 Photograph depicts a First Nations graveyard that overlooked Anderson Lake. 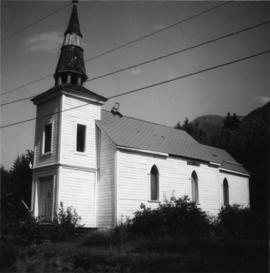 The cross in the foreground was dated 1918. A post with carving, near the fourth grave, was dated 1904. Photograph depicts a horse drawn mowing machines on an Indian Reserve. 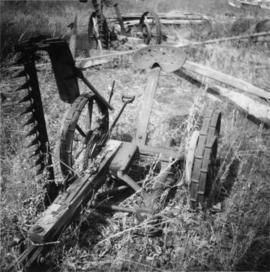 The machine in the foreground was named "Champion" made by B.F. Avery and Company. The other one was named "McCormack Deering." 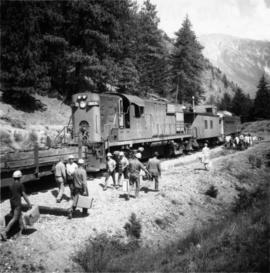 Photograph depicts a rail lifting train slowly moving backwards and collecting rail lengths and track fastenings. 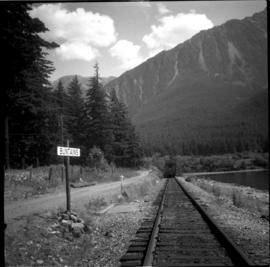 Photograph depicts the Pacific Great Eastern line beside the Seton River which connects Anderson Lake and Seton Lake. The bridge to the left take the road to D'Arcy and Pemberton. 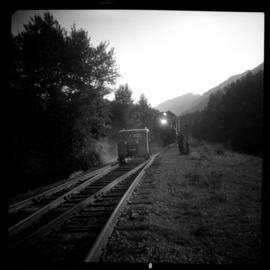 Photograph depicts a 2 car Budd dayliner near mile 139.7, north of Seton Portage. 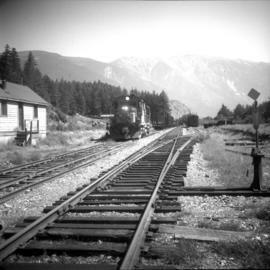 Photograph depicts a passing loop with way freight on the interior part of the loop. 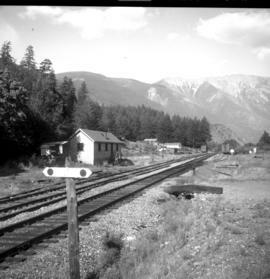 Photograph depicts the Buntain's flag station on the eastern shore of Anderson Lake and about a mile from the depot in Seton Portage. The flag station was created in 1968. Photograph depicts 5 attached cars which are nearest to the camera and belong to the "Bridge and Building" work train. They were set at the location for a week before travelling to Hanceville. 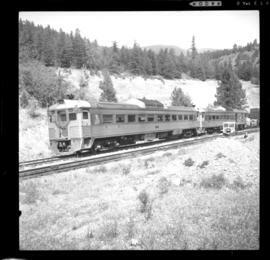 Photograph depicts a ballast car that was built in 1955. 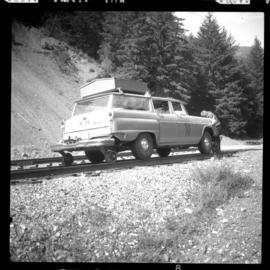 Behind it was a "Bridge and Buildings" work car or a former cattle car built in 1914. 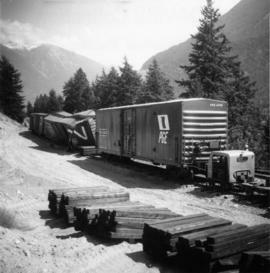 Photograph depicts the rear portion of a southbound way freight on the passing loop in Seton Portage. 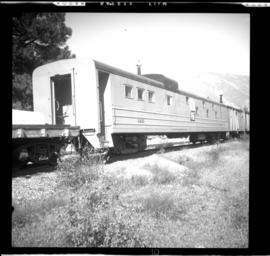 Visible is a caboose with leaf springs. 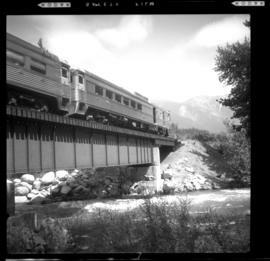 Photograph depicts a northbound daily Budd passenger train (2-4 cars) crossing the Portage River (Seton River) over a bridge that was built three years before. 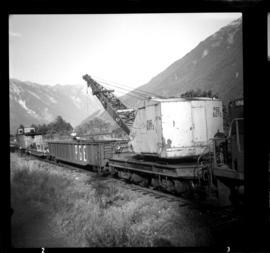 The depot in Seton Portage was found 200 yards behind the camera. 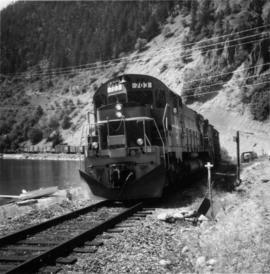 Photograph depicts a 2 car Budd train that had stopped at the depot in Seton Portage. 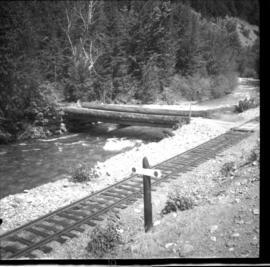 Photograph depicts a speeder which precedes all trains and was crossing the bridge over the Portage River (Seton River). 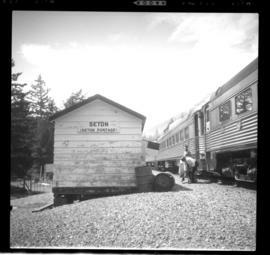 Photograph depicts two "slave units" heading north after having been spliced into the middle of loaded southbound freight the previous day. Continous movement was performed daily. 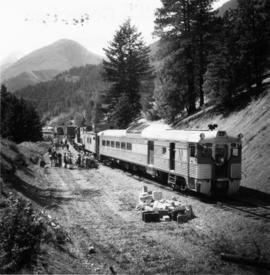 Photograph depicts a steel-lined wreck train car that was used by work crews and consisted of a dining area, kitchen, sleeping quarters, and bathroom. 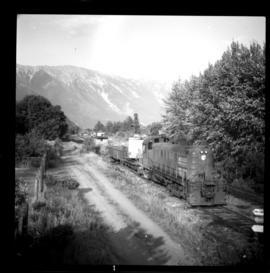 Photograph depicts a 2 Budd car train travelling northbound and crossing the Portage River (Seton River). 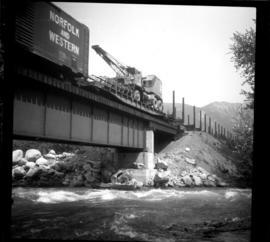 Photograph depicts northbound freight crossing the Portage River (Seton River). 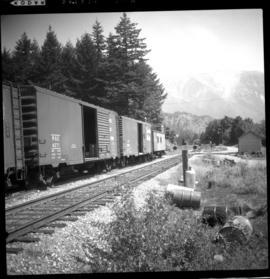 Photograph depicts southbound way freight switching cars. 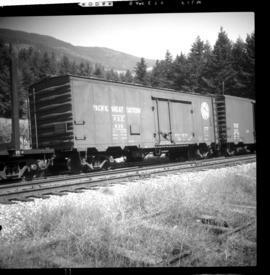 Photograph depicts a north, upgrade, and mainly empty freight preceded by its "checking" speeder which was about to enter a crossing loop. 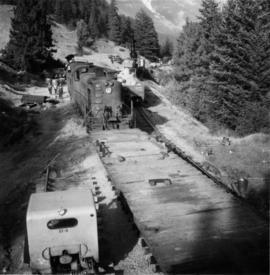 Photograph depicts a passing loop from main traffic as well as a spur for work cars and one frieght unloading loop (a box car on the left is standing on it). 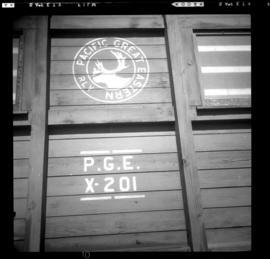 Photo displays a quickly disappearing Pacific Great Eastern logo. Davies found it on a tool car of a track maintenance train. 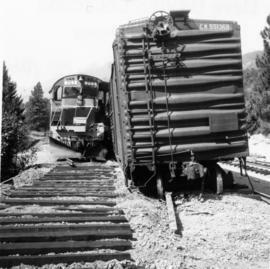 Photograph depicts an inspection automobile that was about to come off track and onto the road in order to investigate a large derailment at the switch on mile 139. 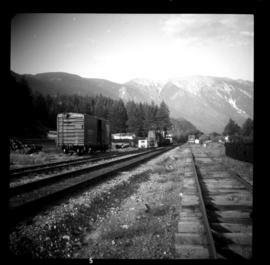 Photograph taken at the depot in Seton Portage. A northbound Dayliner of 3 Budd cars that have stopped are visible. 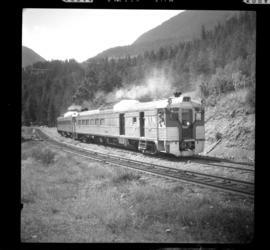 This train ran daily from North Vancouver to Lillooet. 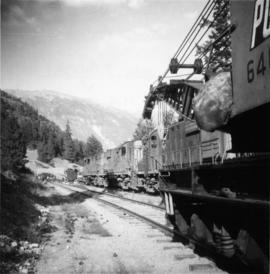 Photograph depicts a rail lifting train consisting of a locomotive, crane, gondola car, flat, and caboose. 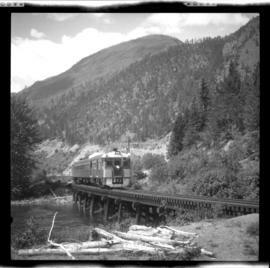 The train was running backwards slowly and picking up train and loose track fastenings on the non-main line side of the passing loop. 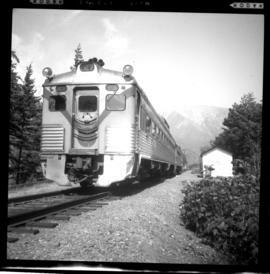 Photograph depicts a 2 car Budd train that mae the North Vancouver to Lillooet round trip daily. 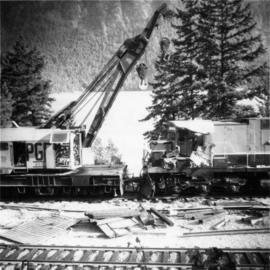 Photo depicts a shoo-fly that had been built around the Seton Portage wreck. locomotive #703 had stood at this spot just before the switch when the cars of the southbound freight piled into it. 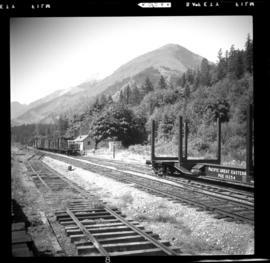 Photo depicts a Pacific Great Eastern working train approaching Seton Portage. 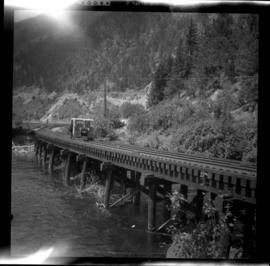 It had been diverted from the derailment to fill in a burnt out wooden culvert on the edge of Anderson Lake. 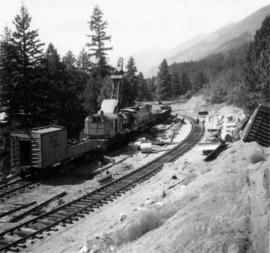 Photo depicts the general view of a derailment, looking eastward. 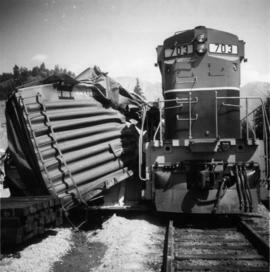 The derailed locomotive #703 was found beside a squashed box car. By this time, a PGE bulldozer had prepared a road bed for the wreck. 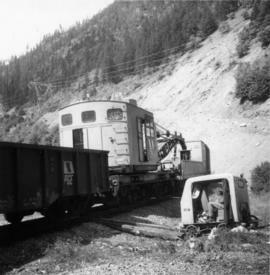 Photo depicts the transfer of a Vancouveer to Lillooet dayliner to the unit made up at Lillooet wich consisted of a budd car, caboose and switcher. 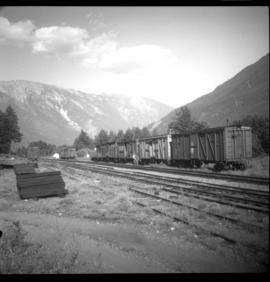 The scene of the Seton Portage derailment was found 100 yards behind the photo. 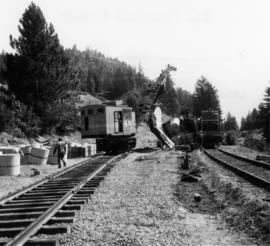 Photo depicts a crane #6501 in position to lift locomotive #703. 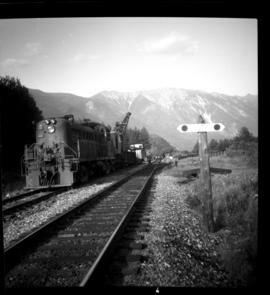 It was about to re-rail one end of the locomotive. Image captured looking towards the south with the shoo-fly in the immediate foreground and Setan Lake in the background. 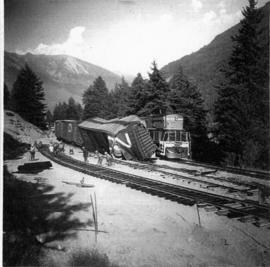 Photo depicts a derailment in Seton Portage at the Pacific Great Eastern broken switch on mile 139.8. Photo depicts the largest crane on the Pacific Great Eastern and is stationed in Prince George. 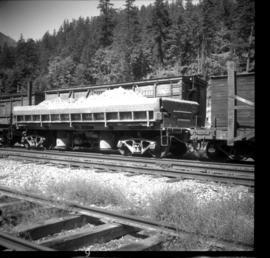 Photo depicts the removal of about 70 bales from a box car. 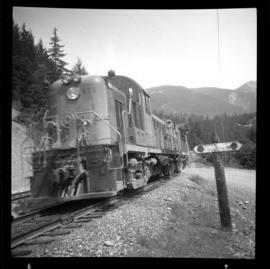 File consists of documentary photographs taken by David Davies of the Pacific Great Eastern Railway Seton Portage Wreck in British Columbia.